Future plans for the end of the road on Kauai’s North Shore. If you have ever been to the end of the road on Kauai, you know it is an amazing place! With it’s breathtaking beauty, Ke’e evokes a mystical, magical feeling. Ke’e has been closed due to the recent flood and road closure, but what does the future of the end of the road look like? For the last 20 years, the county, the state, Board of Land and Natural Resources, land/trust owners have been trying to approve the “master plan’ for Ke’e. Consequently, the Master Plan recently received initial approval and is making many changes which will change the face of Ke’e forever. The response is interesting, some people are in favor, some are vehemently opposed. But during an early morning meeting on Ohau, the Master Plan was approved on June 28, 2018. Under the Master Plan, visitors to the area will be limited to 900 a day, as opposed to 4k a day, according to some reports. Due to this limit, any visitors will be required to have advanced reservations for entry and nominal entry fee required. Haena State Park receives hundreds of thousands of visitors a year. Due to “over tourism” The intention of the master plan is to limit visitors to the area. 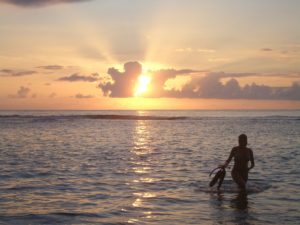 However, the 900 visitors a day does not include; overnight campers and hunters with permits, residents, the caretakers, some volunteers or cultural practitioners with cultural/ancestral ties to the Kauai area. The other changes include a 100-stall parking lot, new entry turnaround, a shuttle stop, and a pedestrian path. The places we love have been loved to death, this plan is sorely needed. This flood has been Mother Earth’s way of crying out to us. The importance of the Hāʻena State Park Master Plan quickly elevated after Kauai’s historic flooding in April 2018. Another factor that elevated it’s importance is the subsequent disaster declarations made by the governor. In addition, funds from the ‘disaster mitigation funds’ could help the $3-5 million in costs for the implementation of the plan. What does that mean to Kauai, you, the visitor & residents? Ultimately, as a result, it is good news for the magical place known as Ke’e, the land, the natural resources, and the cultural practitioners. 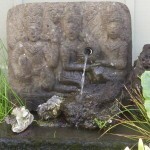 The area is known for it’s the connection to ancient Hawaiian traditions and the practice of Hula. 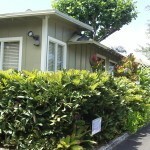 For the visitor, that means you need to plan ahead if you want to visit Ke’e. There will be a nominal parking fee, so you get to feel good about contributing to the future health of this little corner of the world. Above all, I hope to see more hula there. And I know for sure that us residents are looking forward to swimming in the lagoon and enjoying the magical sunsets as well! 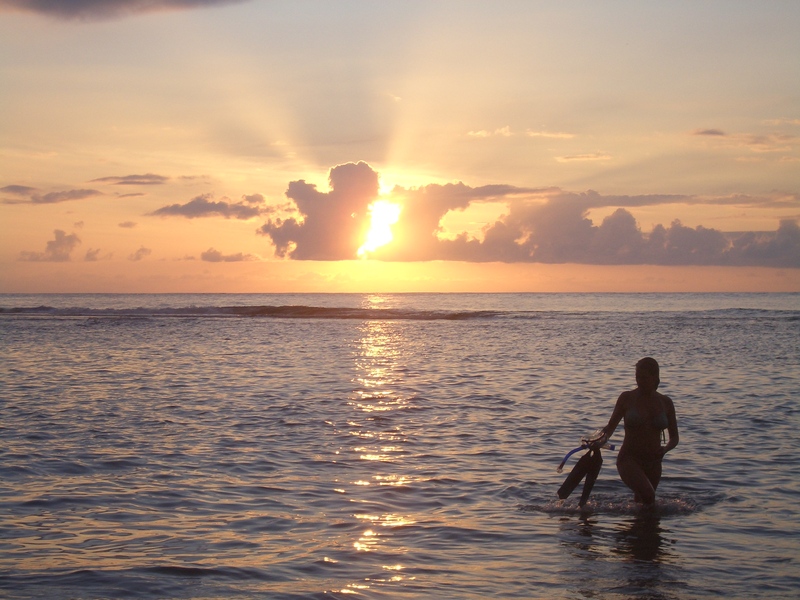 Here’s to a beautiful swim and glorious sunsets at Ke’e. As you may or may not know, there was the big flood in April, then hurricane or Cyclone Lane. 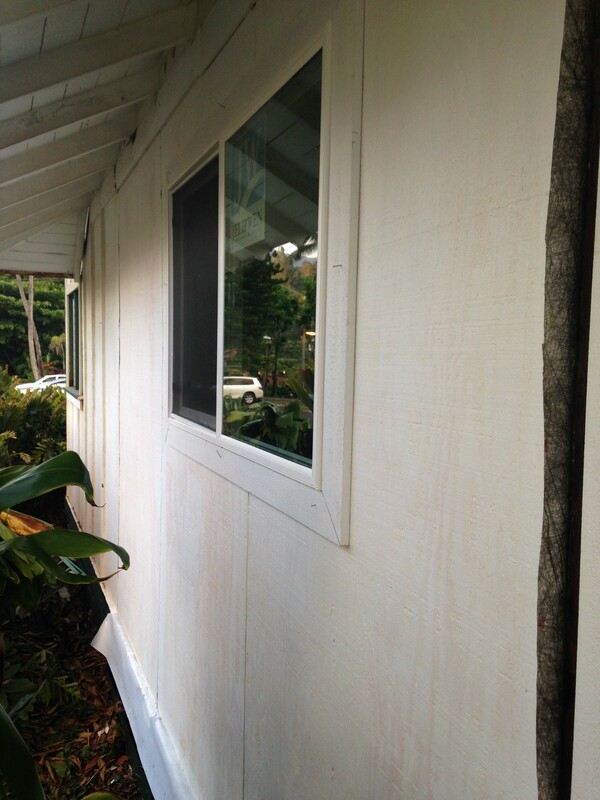 These storms caused severe damage to the north shore of Kauai. The mudslides took out part of the road, and as a result, the roads have been closed to everyone but bonafide residents since April. “The safety of our residents in the affected areas of Wainiha and Haena continues to be of the utmost priority. I want to remind everyone that due to emergency roadwork repairs on Kuhio Highway from Waikoko to Wainiha, the current emergency proclamation and rule is necessary for the well-being of our entire community. approved non government organizations, such as habitat for humanity and Samaritan’s Purse. They are progressing slowly and surely. For us, it seems like forever! but…There have been many significant signs of repairs and progress on the roads. The first part was initially clearing debris and mud, after that the roadwork began. DOT began scaling this tall slope wall, they are pulling tons of earth away so it doesn’t erode. Completing debris removal, slope scaling, slope stabilization, guardrail replacements, and pavement repairs. The challenge is that the Waipa and Waikoko bridges show signs of significant deterioration and load bearing deficiencies. In that, they do not have the capacity needed for current emergency repairs. (i.e., removal of dirt material and placement of boulders needed for revetments at slope repair sites) Or additional slope mitigation work planned for this area within the next two years. The Department of Transportation DOT has been very busy with all manner of repairs since the flood. The plan is to replace the Waipā and Waikoko Bridges, however, the Wai‘oli Bridge can be rehabilitated. All bridges will maintain existing alignments and the one-lane travel route. When the project is completed, the posted load will then be 8 tons on all three bridges. The Department of Transportation is working to ensure that the designs for the Waipā and Waikoko bridges conform to the greatest extent possible to the guidelines recommended by the Kūhiō Highway Historic Roadway Corridor Plan. The Department has also committed that designs for the rehabilitated Wai‘oli Bridge will conform with certain plans. The Secretary of Interiorʻs Standards for Rehabilitation and guidelines recommended by the Historic Roadway Corridor Plan. When will the road open? The bridges can hold more weight after the repairs. I suspect the repairs will move faster than they have been moving. The last projected end date was the end of October 2018. However, we are waiting on an updated ‘best case scenario’ and worst case scenario’ from the DOT. For now, those of us who live here are enjoying the quietude and are busy with trying to make a living. Personally, for 6 months, I have been in the process of creating an online course to help people be healthier. I will announce more soon. * as I am notified of the projected date for opening the road. Please know, prices are subject to change. 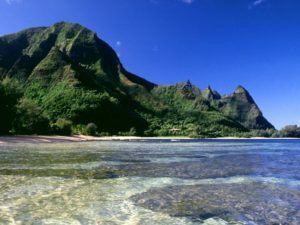 image of the very north shore, looking towards Kalalau, a popular hiking destination. I give my love to you, you give your love to me. We are building the first Public Playground in Hanalei in over three decades. On October 14, 2018, the Hanalei Initiative is hosting the Hanalei Playground Fundraiser. A great playground not only provides children with endless hours of free play and exercise. But it can also help tie a community together by serving as a common space for families to gather. In relaxed setting residents and visitors can connect and interact. As a result, new friendships are formed and community ties are deepened through feelings of belonging. 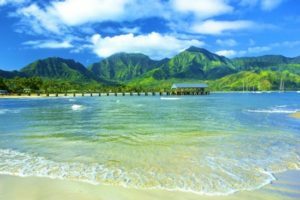 The Hanalei Initiative is in discussions with the County of Kauai to design and build the first Hanalei public playground in over three decades! We have a design committee with participants from the community beginning the design phase and for feedback once we get a few ideas. This is a legacy project that will fill the community with pride for years to come. Tickets to the fundraiser are open to anyone. If you cannot attend, we will assign your ticket to someone in the community who might not otherwise be able to afford to attend, such as a teacher at Hanalei School. We are not certain of a site just yet, but we have a few ideas! We are hopeful that The Waioli Corporation will consider a playground being built behind the basketball court in the Waioli Town Park. Other locations are being considered and a list of pros and cons has been developed. If you would like to participate, have concerns, or want to support please reach out anytime. 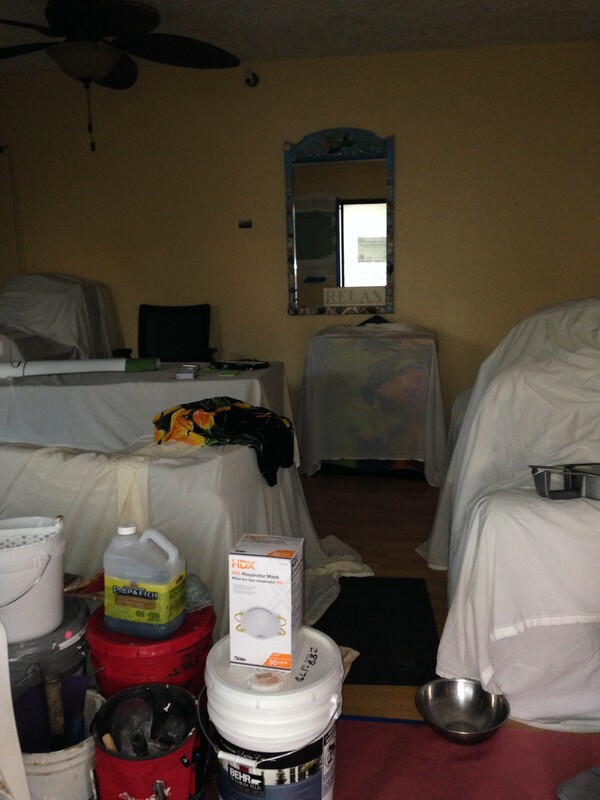 Four months ago, an historic flooding wreaked havoc in Hanalei. 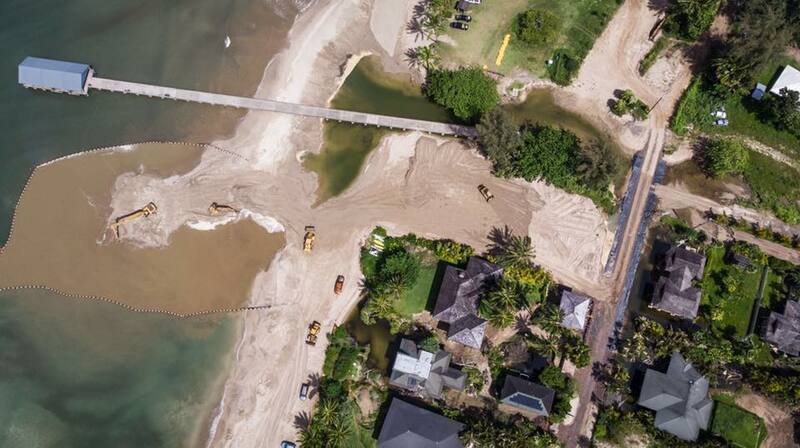 We received a historic 50″ of rain in April which quickly washed away a lot of Black Pot Beach, at Hanalei Pier. As part of the disaster, the heavy rain washed away a huge part of Black Pot Beach. A report from the Department of Public Works was issued in July. It shows that the major damages to the area are: the erosion of Weke Road & Black Pot Beach and the destruction of the ‘Comfort Station’. The county continues to salvage the ruins. One such rehabilitation area is the plan to revamp the Black Pot Beach Park. A University of Hawaii study showed erosion at Black Pot Beach of up to 12 feet in some areas and that April’s flooding eroded 70,000 cubic yards of sand in the area. This was recently quoted in the Garden Island News Paper. The project is to bring the sand and fill in the eroded areas. – such as the Black Pot Beach pier and Weke Road. This project seeks to put ‘Black Pot Beach’ on the map again! Known as the ‘Emergency Declaration Funding’, the project is only for repairs rather than redesign. The first stage of the project is dredging of the Bay, which is currently underway and is illustrated in the images. Estimated at about a million dollars, predictions show that the project is due for completion in the last quarter of 2019. Furthermore, the repairs should withstand further devastation in the future. As Weke Road is the only land route to access the Beach Park, rebuilding the road will involve dredging of sand from the bay. Afterward, the area will be erosion-proof by adding a layering of geo-fabric and rocks that can give such resistance. Erosion is fast becoming a threat to life and properties, we must curb erosion! The mechanism of erosion results from the constant changes in the rising of the sea level. 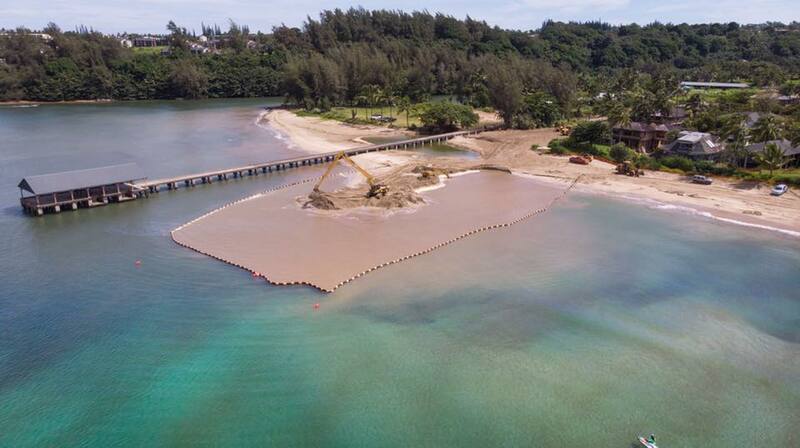 near the pier in Hanalei Bay, part of the ongoing construction project on Weke Road. “The yellow barriers around the dredging site are silt curtains, and their purpose is to minimize silt migrating out of the work area,” said Lyle Tabata, acting county engineer. From time immemorial volcanic islands wash down into the sea. Hanalei Valley is an uplifted coral reef, covered by mud from mountain erosion. Every heavy rain brings down more layers of mud. Ancient Hawaiians, never really lived full time on the beach, it was the ‘beach house’. The rebuilding project has begun in order to restore peace, tranquility, and beauty to the region. The changes in the floodplains of the Hanalei River are under corrective procedures to preserve what once looked like Hanalei. Kauai is an amazing place and we need to have more people helping to make real (positive) change. Participating in the process is important and we can all do more to help. The good news is if you would like to help, you can. “Hanalei Initiatives”, is a group of people committed to identifying challenges and completing solutions to Hanalei’s most pressing problems. We are community driven and supported, and we work in partnership with government. 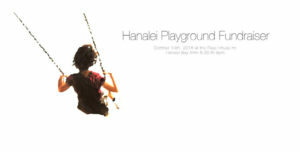 We are building the first Public Playground in Hanalei in over three decades, click here to help. 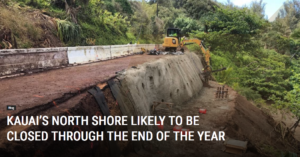 After disastrous flooding struck Kauai’s North Shore in mid-April 2018, causing damage to the highway and bridges. Initial estimates had the North Shore reopening to the public around October 2018. 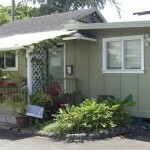 Access to the North Shore is still cl osed to the public past the town of Hanalei. 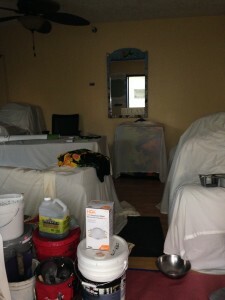 The damage and repairs are extensive. Then, Hurricane Lane struck the island at the end of August 2018. Bringing new flooding and damage to the area, which setback the timeline. The Hawaii Department of Transportation (HDOT) recently updated the time estimate for the road closure. They said “Kuhio Highway, the road to the North Shore will be closed to the public until the end of 2018”. This is the only only land access. 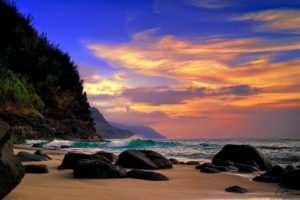 The closure includes access to the popular Kalalau Trail, Ke’e and Tunnels and Lumahai. 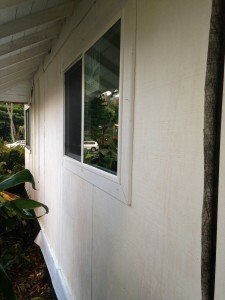 LIHUE – Tropical Cyclone Lane brought additional repairs. The timelines and estimated costs are still unclear. These emergency repairs to Kuhio Highway from the April 2018 flooding are being reassessed following the recent flooding. Before the cyclone, HDOT had an estimat for the repairs. The goal was to be completed in October at a cost of $80 million. Flooding on August 27 and 28 inundated Kuhio Highway at Hanalei Bridge and between the Waikoko and Wainiha checkpoints. Saturation from the heavy rains also compromised the slope. The location of the compromised slope is at mile marker 1.0 leading up to the Hanalei Bridge. This also resulted in rockfall and a fallen tree. HDOT is performing rock scaling on this slope today. This will prevent additional material loosened by the rains from falling onto the roadway. In summary, there were setbacks due to additional flooding. Once, we complete the in-depth assessments, we estimate that the project completion date is closer to the end of the year. Visit Emergency Repairs project website for a full a full list of additional work/estimated costs. I am so happy to share with you that we have just earned the Trip Advisor Certificate of excellence award for 2016!! We are committed to providing consistent excellent customer service and hopefully it shows. A big mahalo to all our guests for visiting us year after year and being so gracious and sharing your experiences! A HUGE mahalo to my staff for being awesome! 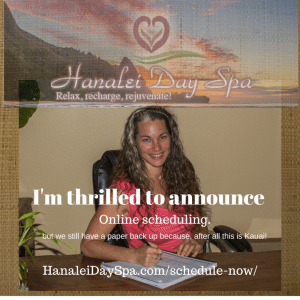 I love that you can now schedule your spa services online at any time of the day or night! A few years ago, I considered online scheduling and did a lot of research, I mean A LOT! I spent hours looking into what they offer, their limitations, costs, all the details, it was a huge learning curve because I didn’t know what I would need. I dropped it because I wasn’t convinced that it would be a good fit, and at the time we had a lot of internet interruptions. Fast forward to 2016, I started doing research again, with a solid consistent internet connection! This time I called the top 6 companies and asked them basically 2 questions; do you schedule for couples and can your system accommodate add-ons (like our beachside, deep tissue, etc.)? Most of them had this complicated ‘work around’ as they call it. But Booker didn’t. For a while there, I considered going into a lucrative and well needed online scheduling business! I am thrilled to announce, we have added ONLINE SCHEDULING. You can now schedule anytime day or night! Remember to schedule your services in advance we fill up fast! If you would still like a human, just call us! Do you know the difference between surviving and thriving? What is your idea of self care? 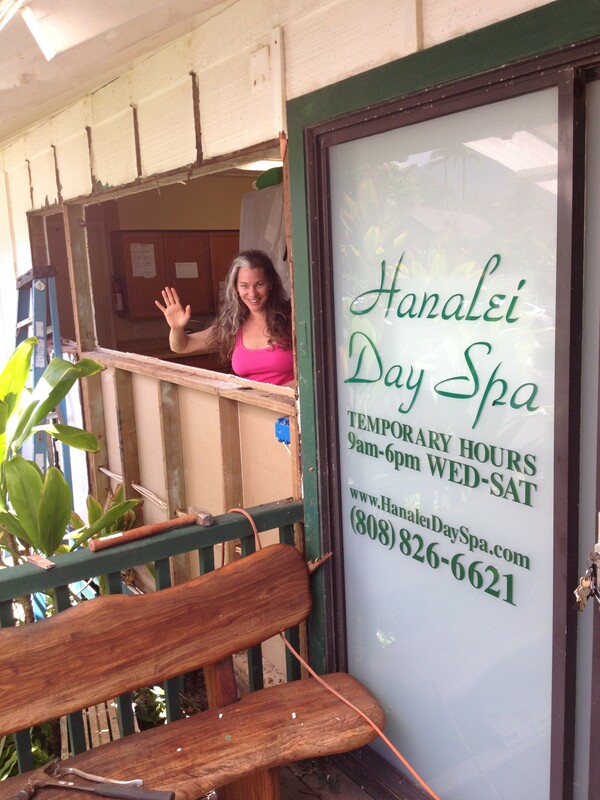 Here at Hanalei Day Spa, we are a holistic business geared towards thriving and really enjoying life our own selves, and helping you to do that too! PLEASE JOIN ME IN CELEBRATING OUR NEW MENU OF SERVICES! Whether or not you come in to receive spa treatments, let me inspire you to take care of your self, fill up your self love cup so you can love those around you even more. PLEASE SHARE IF YOU FEEL INSPIRED! Venus has been retrograde, during venus retrograde the ‘Venus energy’ is not expressed outwardly, in fact, oftentimes there are can be the potential for relationship and or interpersonal challenges during this retrograde cycle. The best approach is to internalize and ruminate on whatever lessons are brought to us during this cycle. To celebrate the true venus energy, is to revel in beauty in all it’s forms; our (and other’s) beauty, the beauty of nature, a child, experience pleasure and all the lovely delights the senses have to offer. To deeply enjoy the fragrant flowers, the delicious smell of the air, tastes of food, to enjoy touch and create and see beauty in everything. 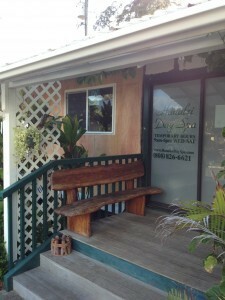 Hanalei Day Spa is a Venus place. Venus retrograde affects us all in different ways, based on where it is in our chart. We might have been ‘working on’ our appearance during this recent cycle or the appearance of our home, some sort of internalized Venus energy. 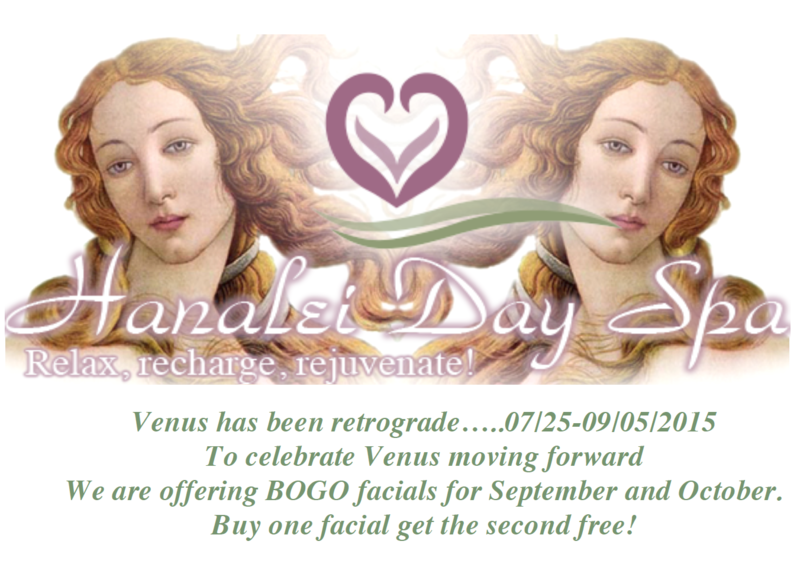 I want to support you in celebrating your own beauty by offering this HUGE DISCOUNT on facials! We fill up quick, Call ASAP to schedule! no need to print, or email, it is an interactive form that automatically sends…. After years of stacking all of the intake forms, I have decided to go paperless. It is the same form, just online. The other great thing is that if you didn’t frequent the spa enough to make it with the privileged echelons in the filing cabinet (6X per year) and had to fill out your form every year or so. Now after filling it out, you will be on file! so, yeay we are saving trees! Yaey, look at our little cottage! 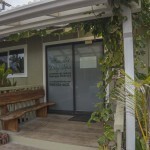 Our humble boutique cottage day spa. After much anticipation and careful planning we finally started renovations last week! 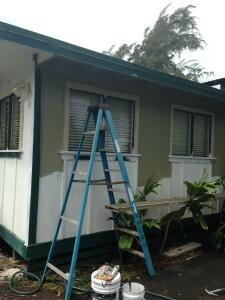 We have a whole new front wall, window, new trim and fresh paint! Below are some images of the progress.